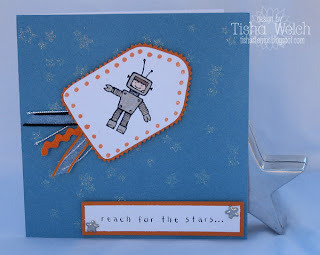 bitter sweet stamping: Blog Bonanza!! Still here??? Contrary to what you have seen here, I really have been stamping some! I have just been battling with my picture-taking skills, so I have refused to post anything until I felt like I had some decent pictures to show!! I still don't think they are perfect, but they are better!! So, sit back and prepare yourselves for multiple posts today!! First of all ... Happy Halloween everyone!! I hope your day is spooky, scary and FUN!! We are heading to a friend's house this afternoon for a little party, then trick or treating in the neighborhood! We have had lots of fun in the past few days visiting the pumpkin patch and carving our pumpkins last night! I'll post pictures of all that soon!! Okay, on to the cards! I'm not going to go into a ton of details, so if anyone has any questions, please post a comment and I will answer them!! Thanks for hanging in there with me!! Have a great day!! I was playing with my rocket boy, and I decided that he needed a rocket ship! Do you recognize it?? That's a tag from the new A Muse Clear Tag set! How awesome is that?? Stamped it on white, matted it on orange and trimmed around it with my mini pinking scissors! I love these new clear sets!! And the A Muse ribbon ... I just keep reaching for it! I made a few of these coaster post-it note holders for my aunts and cousins who were in town last week for a family reunion! They come together so quickly - a bit of modge-podge to hold the paper down, some sponging on the edges and the big clips from Wally World! 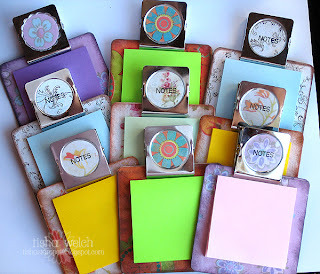 I punched matching circles with a 1 3/8 inch punch, then stamped the "notes" from the A Muse personal stationary set, and covered the whole thing with a circle A Muse Creative Candy!! Easy-smeazy!! The girls were quite impressed! Most of them live in RV's for about half the year, so they were so excited to have something magnetic to keep close! Stay tuned ...more cards to come!